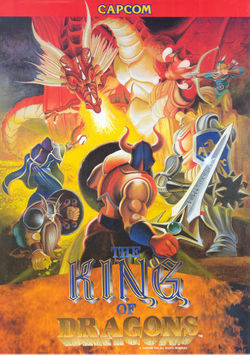 The King of Dragons is a 1991 side-scrolling beat 'em up by Capcom in which players travel through the kingdom of Malus to defeat the monsters that have taken over, as well as their leader, the red dragon Gildiss. The setting is very similar to that of Dungeons & Dragons and other medieval fantasy worlds, with familiar monsters such as Orcs, Gnolls, Harpies, Wyverns, Cyclopes, and Minotaurs. The game has 16 levels, though many are quite short. Much like Knights of the Round, King of Dragons features RPG-like leveling. Characters' health bars, range and other attributes increase as they level up. Along the way, different weapon and armor upgrades can also be picked up. The game was ported to the SNES in 1994 and is also part of Capcom Classics Collection Vol. 2, released for the PlayStation Portable in 2006. This was one of the many Capcom games to feature the Yashichi power-up item. There are three hidden throughout the game, each giving the player an extra continue. This page was last edited on 29 March 2010, at 08:28.